BAUDRY DE LAMARCHE, JACQUES, purchaser of Lamothe Cadillac’s [Laumet] rights at Detroit, attorney in France of the Charon brothers; baptized 13 Sept. 1676, at Trois-Rivières, son of Urbain Baudry, dit La Marche, and Madeleine Boucher; d. after 1738, probably in France. Very little is known about Jacques Baudry de Lamarche. The son of a Trois-Rivières edge-tool maker, he moved to France at an unknown date and made his home in Paris. 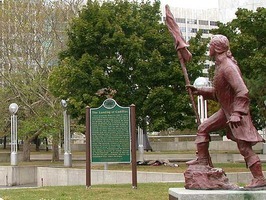 Around 1723 he purchased Cadillac’s rights to certain properties at Detroit, consisting of several buildings which had deteriorated, a mill, some cattle, and an undetermined area of both cleared and uncleared land. An attorney, Véron* de Grandmesnil, was appointed by Baudry to take possession of these but he soon became involved in difficulties with Philippe de Rigaud de Vaudreuil and Alphonse Tonty over the extent and general state of the properties in question. Disputes over these matters continued for at least five years. During this time, Baudry plagued the ministry of Marine with claims and counter-claims and Grandmesnil laid his case before the governor and intendant in New France. A decade passed before the name of Jacques Baudry reappeared in the history of New France. 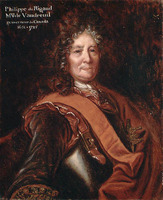 In 1738 he was asked to serve as general and special attorney for the Frères Hospitaliers de la Croix, a charitable order founded by François Charon in Montreal. A merger with the Frères de la Salle, or Frères des Écoles Chrétiennes, was being contemplated, and Baudry was to collect outstanding debts and oversee the union. This is the last known reference to him in French documents. AN, Col., B, 46–50; C11A, 45–50. P.-G. Roy, Inv. ord. int., I, 254, 265. É.-Z. Massicotte, “Inventaire des documents et des imprimés concernant la communauté des frères Charon et l’Hôpital Général de Montréal sous le régime français,” APQ Rapport, 1923–24, 187. Tanguay, Dictionnaire, I, 31f. ; II, 152 [Tanguay’s confusion about Jacques Baudry’s parents is evident; it is certain that Jacques Baudry, son of Urbain Baudry, was never married in New France. c.j.r.]. Aegidius Fauteux, “Jacques Baudry de Lamarche,” BRH, XXXVII (1931), 203f. C. J. Russ, “BAUDRY DE LAMARCHE, JACQUES,” in Dictionary of Canadian Biography, vol. 2, University of Toronto/Université Laval, 2003–, accessed April 21, 2019, http://www.biographi.ca/en/bio/baudry_de_lamarche_jacques_2E.html.